Can't remember where I first saw this cute little idea. there is a pattern on Ravelry to make this. I cannot work in sc w/ small hooks so I did hdc with a 5.mm hook. the whole trick is to make a ball as your starting point. 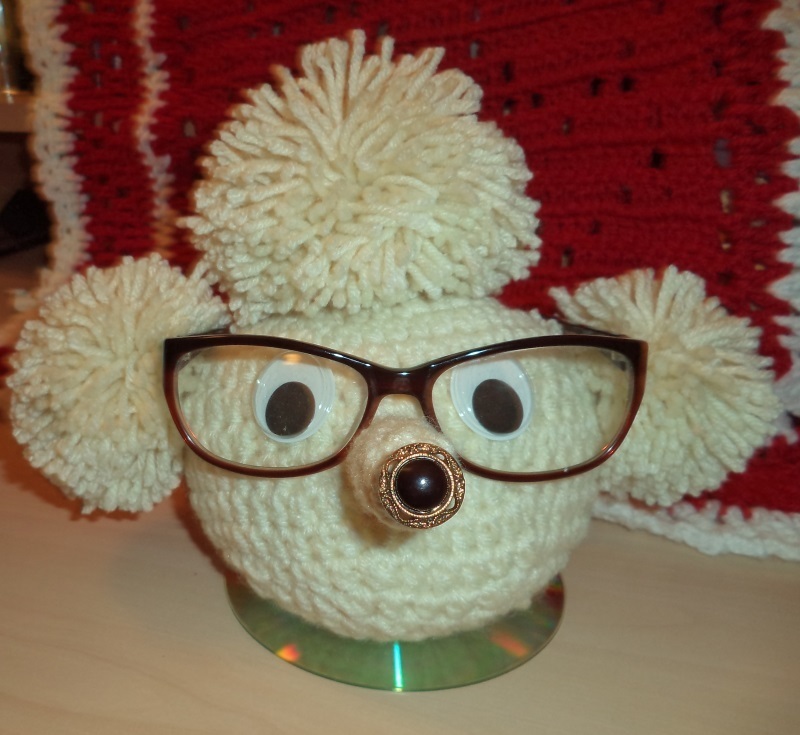 I added a CD as a base because he kept falling forward w/ the specs on. In the Boxing Day CAL we were thinking this would make a good donation to seniors' centres. Maybe a short crocheted tube as a 'dog collar' would work? Might need some stiffening with plastic canvas tho. Or wide mouth plastic lid, like from a mayo jar. I like the dog collar idea! That is adorable. I like the idea of a collar. I've made dozens of those. You need a TP tube and a Worcestershire sauce bottle. we filled them with bath salts. it was the beginning of my crocheted poodle fascination. :manyheart. I agree. if you just make the people ones you don't need the wool eating pompoms. You piqued my interest by mentioning 'people ones' so I took a look--patterns below for those interested. Hilarious how some amended the muppet ones to make different characters (you need to be a Ravelry member to see the projects).